You can also add goodies like headphone,glass,monocle,mustache,beard,horn,rims….even smilly faces! No other software is going to provide these! Now there are many Filters available in Image Cartoonizer Premium, so you can convert your photo to many new cartoons effects, vintage, Instagram look…you can also add Dynamic Contrast and Brightness to your images. Use our software to illustrate your book, your website or to make custom coloring pages for your kids. Replace that cookie cut forum avatar by an actual cartoon of yourself. You’ll let people know what you look like without giving them your photo. Make cartoons of your friends, your dog, your house, your neighborhood and don’t forget celebrities and politicians. Cartoons make fantastic gifts for friends and colleagues. They look great on T-shirts and mugs too. This program is fun and addictive. It is also intuitive and very easy to use. You don’t need any artistic skills, as no drawing is required. 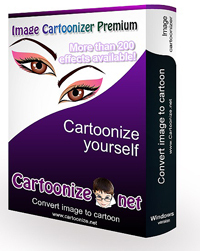 More than 250 effects available: Cartoon effects, Color effects, Instagram effects… Cartoonize your personal photos and pictures directly from your windows desktop! Convert more quickly and with high quality! Convert large photos for best result! Crop function to remove unwanted parts of an image! Edit your photos and add many Goodies! Share your converted photo directly on your Facebook! Print your converted picture from the software! Cartoonize your photo without any Watermark! No other standalone program or software is needed! No need internet connection! Support both 32 and 64 bit!